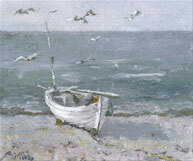 Most collectors of Impressionistic art buy it because they enjoy the beauty of the painting. However, many investors do not realize that to buy art of this style is one of the most important long term investments they could ever make. Amazingly enough, the founder of Impressionism, Claude Monet, was alive only eighty-two years ago and the value of his paintings have increased by an astonishing ten thousand times. The interesting question is how did his paintings, as well as other paintings of other artists of Impressionism, gain so much value in such a relatively short period of time? The works of this extraordinary style of painting now sell for several million dollars. Can you think of a long term investment that gives you more pleasure and greater return? It would be fascinating to learn the answer to why Impressionistic art has such a great appeal and continues to increase in value. The viewer receives a feeling of accomplishment and satisfaction due to the fact that he has unconsciously reconstituted in his mind what the artist has felt and expressed through strokes of colors, defining the different light he is perceiving. Stepping backward from the painting, the viewer feels the movement and smells of the atmosphere as if he is himself out of doors. However, when he gets closer to the painting he sees nothing but incomprehensive shapes of colors. The viewer perceives a great sensation of peace, serenity and internal happiness that the artist felt as he painted outdoors. Because of the great appeal explained above manifested by the thousands of people who crowd the entrances of museums each time there is an exhibit of this style of art, the value of Impressionism will continue to increase with the years. As Impressionistic art and its artists becomes more scarce, there will be an even greater demand to view its beauty. 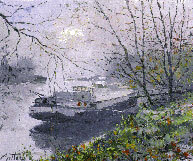 Impressionism is an art which requires a special talent beside just the talent of being an artist. It requires many years of experiencing painting outdoors before relying on your painting as your only source of income - according to Monet, at least twenty years. This technological age is luring young talent in a new direction that assures a steady living. They are able to express themselves in a new artistic form through computer graphics. In conclusion, it is difficult to foresee, in twenty years, the cost of paintings from the School of 'true' impressionism. The paintings of Impressionism you purchase today, if we consider the facts above, may increase in value by hundreds of times. Remember Monet, having lived only eighty-two years ago, and his paintings have increased by the thousands! collectors do well to consider the value of their investments.